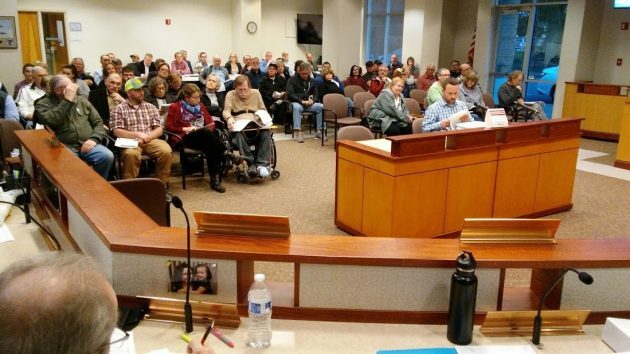 The audience listens to the Pheasant Run proposal at the Albany Planning Commission meeting on Monday, March 5. New Albany subdivisions have to meet six criteria in order to be approved. But there is no mention of preventing crowding, or congestion at rush hour, or saving wildlife, or anything else that comes under the admittedly vague concept of preserving livability. This was apparent once again when the city’s planning commission held a hearing Monday on the preliminary plat for the endearingly but deceptively named Pheasant Run, a big subdivision that would cover much of a so-far undeveloped tract of farmland in the middle of North Albany, north of Dover Avenue and west of Crocker Lane. By the time of the hearing the developer, Hayden Homes, had revised the original plan from 148 lots for single-family houses to 147. Instead of cutting down all the old white oaks on the property (a Google aerial view shows eight), the revised plan would save two big ones. Houses and streets would cover about 35 acres of the 47.5-acre tract. Twelve acres would be left open and natural. More than dozen neighbors living in the subdivisions surrounding Pheasant Run testified. Most of them complained that North Albany had already become too crowded and the addition of 147 houses would make traffic even worse in the mornings and afternoons, not to mention other concerns including the impact on schools, or the loss of venerable trees. North Albany is expected to have a population of 8,000 by 2020, up from 5,100 in 2000. The problem with traffic is that much of the district’s morning commuter traffic funnels through just two main roads — North Albany and Spring Hill — and then across one two-lane bridge approaching the 100th anniversary of its design. But none of that means anything to the criteria for subdivisions in the Albany development code. Pheasant Run obviously meets the criteria, and it will be approved, just like other big housing tracts in North Albany have been approved without regard to their cumulative impact since the formerly rural area was annexed by Albany in June 1991. Not so fast, though. The planning commission continued the hearing until Monday, March 19, and the process is still open for testimony from both sides. The field that will become Pheasant Run, looking east from Essex Street. Wow do you mean the planners have forgotten major portions of the real world. 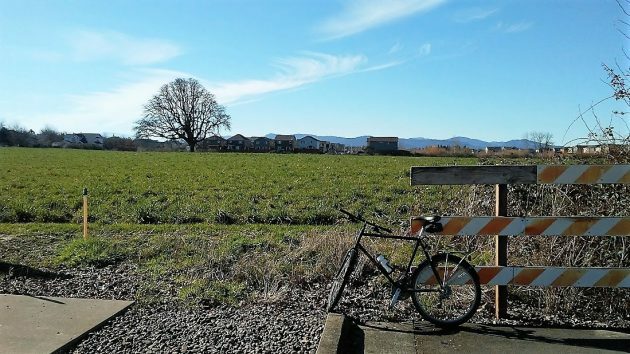 Perhaps the Council needs to tell the planners what is important , not the other way around..
I’ve been intensely interested in planning and zoning issues for decades, and it’s been fascinating to observe how Oregon’s model has basically protected the rural nature of our countryside. That said, “livability” and a generally strong economy mean that people want to move here, and most of that new population winds up inside of Urban Growth Boundaries. There are plenty of people who truly believe that all growth –construction, population, or however else you want to measure it– is inherently, morally “good”. If we elect people who are “pro-growth” we will likely get what we ask for. Millersburg and North Albany are pretty good examples of this phenomenon. I wonder what would happen if we decided that long-term improvement in factors like livability and standard of living were the true standards of “growth”? You can’t have it both ways and rules will be changed at the whim of bureaucrats. The Cities current tree cutting permit process is intended to protect old Heritage trees from being cut down. Anything less that protecting ALL of the old oaks that are healthy is a shame on Hayden Homes and the City. Glad I’m retired. Getting anywhere from North Albany between 7 and 10 am or 3 and 6 pm is a nightmare. Unless another bridge is built soon or access to another major highway south to Corvallis is added, the nightmare is only going to become a night terror. The Mayor, The City Council, The City Planning Commission: I’d like to hear your answers to Hasso’s blog and the replies above. You have some ” ‘splainin’ ” to do! Sheesh. Land use planning was a radical implementation in the McCall years. It was an attempt to bring disorder out of chaos to assure liveability for future generations. It balanced the “it’s my land so I’ll use it my way” with protectionists who preferred no use at all. Seems that we’re having the same discussion here. Having said that, approving development without assuring infrastructure is irresponsible. BTW, when looking for a post-retirement abode, I had to rule out anything that connected to Gibson Hill. As age advanced and function declined, I could only see a downside. Last night while walking and contemplating my usual rant favoring higher density (and about cars being the root of all evil, but that’s irrelevant in this case), I stumbled upon evidence for this blog’s majority that I can’t in good conscience withhold. About 1/3 mile south of the Benton County Fairgrounds in Corvallis is a new street off SW 53rd Street called Touchstone Place (typically meaningless and pretentious developers’ name). There are about a dozen very big and tall looking houses on very tiny lots unbearably overlooking the old neighborhood on SW Cherry Avenue. I wanted to also say “pleasant” neighborhood, but that’s difficult with 53rd Street traffic noise. Touchstone is not on Google Maps yet, but that part of 53rd Street is on Street View. It might not be clear, I meant that the new houses (under construction) are visible on Google Street View from SW 53rd Street, but not from SW Cherry Ave.
A point I failed to make is that there must be a market for this type of housing, and it’s far from “low end.” The neighborhood reminds me a lot of parts of North Albany, with an almost “rural” character. FYI, they are cutting trees down on this “proposed subdivision” right now! Thought they would at least wait for approval. Is this legal? Ignore my last post. I was given misinformation by someone who lives nearby the site. Apparently she could hear cutting and assumed it was there.